The Spa Hotel Ulrika Karlovy Vary is situated in the center of this resort community. This provider of Karlovy Vary accommodation is located nearly equidistant from the city shopping area and one of the main mineral springs. From the Spa Hotel Ulrika Karlovy Vary, it is an approximately 90 minute drive to the international airport in Prague. The rooms at the Spa Hotel Ulrika Karlovy Vary are rated as four-star level accommodations. Each of the rooms is provided with amenities which included television, a minibar and a desk. Balconies or terraces are standard with every room. Room service is available at this hotel around the clock. 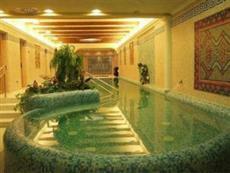 The Spa Hotel Ulrika Karlovy Vary contains its own spa which offers a host of different therapies. For those guests who simply wish to relax on their own, there is available to them a sauna, Jacuzzi and a swimming pool. The hotel also provides luxuries which include a restaurant and a bar located right on the premises. Practical amenities include shops and safe deposit boxes.